So I have security cam under ISP natted 4G internet connection. So i cannot acces to camera from internet. 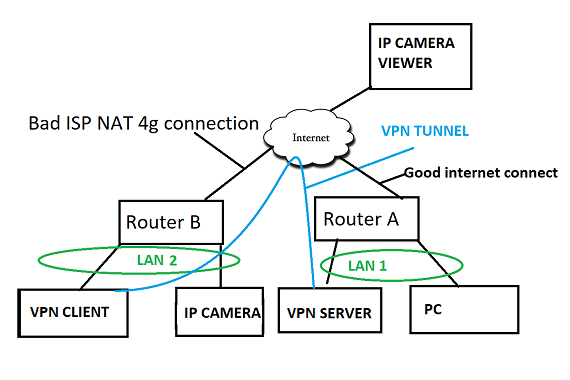 Im planning to connect raspberry pi based VPN client to Router b LAN (where is this camera and ISP natted internet connection) and rapsberry pi based VPN server under Router A LAN where is "good" internet connection without restriction. And make VPN pipe between these two LAN. To do this i need to make bridge VPN connection ? In addition i want connect to security camera from anywhere (without) VPN connection by using my Router A and it's internet connection and router port forward. Is this possible ? And if it is how i need to make configuration? Sorry for my noob questions and thank you in advance! Last edited by silmo on Thu Mar 15, 2018 8:11 pm, edited 2 times in total. To do this i need to make bridge vpn? edit: And my ip cam or actually two cameras are foscam camera. So they are just two normal web server. I have made some progress. I follow up this guide https://community.openvpn.net/openvpn/wiki/RoutedLans. Now i am able to ping from "pi vpn server" (192.168.188.68) to "pi vpn client" (192.168.1.60) and vice versa. I understand i need some NAT config to vpn client ? What exactly is command and where write those if three cameras have IP adress example: 192.168.1.70, 192.168.1.80 and 192.168.1.90. And i want JUST those to get acces to internet through vpn pipe. My lan2 router doesnt have ip route options :/ Do i have to configure my pivpn server nat too ? i am able to ping from "pi vpn server" (192.168.188.68) to "pi vpn client" (192.168.1.60) and vice versa. You will have to customise that to your environment. iptables and block access to the VPN from other nodes. My lan2 router doesnt have ip route options :/ Do i have to configure my pivpn server nat too ? You do not have to configure NAT on the server but you may find that easier. Personally, I find using NAT complicates things but you don't have much choice at your client end. You could install a better router or make the RPi the gateway (will require two real ethernets). You could before .. ? Make sure IP forwarding is enabled on the client as well. "Next, you must set up a route on the server-side LAN gateway to route the VPN client subnet (10.8.0.0/24) to the OpenVPN server (this is only necessary if the OpenVPN server and the LAN gateway are different machines)"